Luka Modric has described a report claiming he approached Inter about the prospect of a transfer as "the greatest nonsense in history". Real Madrid sent an official complaint to FIFA, alleging that the Nerazzurri contacted the player illegally over a potential move. A report in La Gazzetta dello Sport has claimed FIFA spoke to Modric as part of their investigation, at which point the Croatia international said it was he who made contact with the Serie A club first as he wanted to play alongside compatriots Marcelo Brozovic, Ivan Perisic and Sime Vrsaljko. Futbol al Reves referenced the story in an Instagram post early on Monday, and Modric wrote a response dismissing the report as false. "This is the greatest nonsense in history!" a reply from the 32-year-old's official account read. The rumours of Inter's interest in Modric created a bitter subplot to the transfer windows in Spain and Italy. Inter coach Luciano Spalletti claimed last week the player had expressed an interest in moving to San Siro, despite Madrid president Florentino Perez insisting nothing less than the value of his €750million release clause would be enough to tempt them to sell. 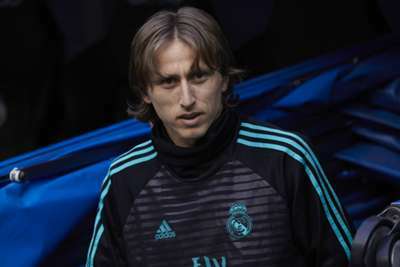 LaLiga president Javier Tebas then hinted at financial impropriety on Inter's part when discussing their surprise interest in Modric, prompting the club to launch legal action. Modric came off the bench on Sunday in Madrid's 2-0 LaLiga win over Getafe at the Santiago Bernabeu. The midfielder was confirmed as one of the final three nominees for UEFA's Player of the Year award on Monday, alongside former team-mate Cristiano Ronaldo and Liverpool star Mohamed Salah.